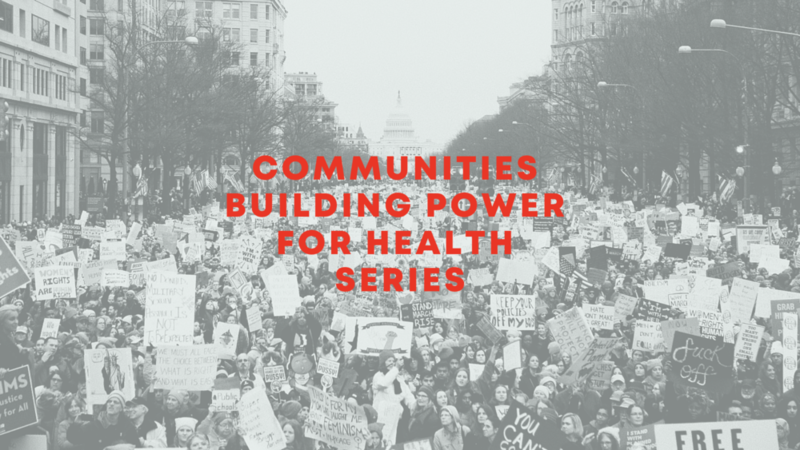 These short video highlights from our Communities Building Power for Health series show examples of the transformative ways community organizers are shaping public health by addressing different social determinants through multi-pronged and intersectional approaches and strategies. Organizers strengthen residents' ability to address various issues over generations: in turn, building long-term power and solutions that are unique to the terrains of their communities. We can follow the example of these health justice pioneers and encourage more resources to go towards their work. Learn more about this creative solution-making by watching the videos. This video documentary is about Pan-African Community Development Initiative (CDI), an organization based in the Bronx, NY, highlighting their income tax preparation workshop as part of their mission working towards economic justice for the Bronx, New York. This feature is a Communities Building Power for Health (CBPH) production, and part of a multimedia case study feature about Pan African CDI. This Communities Building for Health video features Nollie Jenkins Family Center, a grassroots organization based in Durant, Mississippi that is working towards improving the lives of young women and girls as well as the health and wellness of their community. "NJFC visualizes an energized and involved community where all people, young and old, are valued, nurtured and supported as we work together to build and sustain communities that are purposeful in ensuring that the environmental, political, cultural, recreational, educational, economic, spiritual needs of its citizens are actualized and preserved." "Our mission is to advance the fundamental goal of empowering the citizens of the community by developing grassroots leaders and organizers through the building of strong community organizations as the essential means by which they are enabled to hold the political, educational, and environmental systems accountable to the needs and interests of the African-American community! Our mission is to advance the fundamental goal of empowering the citizens of the community by developing grassroot leaders and organizers through the building of strong community organizations as the essential means by which they are enabled to hold the political, educational, and environmental systems accountable to the needs and interests of the African-American community!" - from Nollie Jenkins Website. The Praxis Project is honored to share this story about the ways La Union del Pueblo Entero - LUPE is #BuildingPowerforHealth in our latest Communities Building Power for Health video! Through partnerships with local healthcare organizations, LUPE is removing barriers to health care and helping provide vision exams for entire communities using their Mobile Health Clinics! To support LUPE and to learn more about this organization, please visit their website at LUPENET.org. Menikanaehkem - Community Rebuilders are #BuildingPowerforHealth as a community based organization within the Menominee Reservation in northeastern Wisconsin. Watch this video to see how Menikanaehkem is healing their community through a wide range of initiatives aimed at language and cultural revitalization, food and energy sovereignty as well as addressing social and environmental justice issues. Meninkanaehkem invited The Praxis Project to learn more about the inspiring work that they are doing! Interview with Anahkwet and Tony Brown! Miami Children's Initiative (MCI) is #BuildingPowerForHealth in Liberty City, FL. Working within the community MCI has organized a monthly fresh food co-op, providing their families and residents with a box containing over $50 worth of produce... for only $5. Watch this video to see how MCI is promoting food justice and working towards health equity for their neighborhood. Joseph Martinez II, MCI's Health & Wellness Coordinator, shares with The Praxis Project his experiences organizing this program, promoting healthy food access and his hopes to expand! To support MCI or to learn more about this organization, please visit their website at iamlibertycity.org! Black Women for Wellness (BWW) presents Kitchen Divas, community-based cooking classes focused on health and wellness! Chief Kitchen Diva Veronica Mayes-Jackson guides the class as they prepared and taste-tested delicious and healthy appetizers, meals, and desserts. The class focuses on using fruits and participants prepare, cook and eat a full and nutritious meal while learning about food purchasing tips, ways to extend food shelf life and other cooking strategies. The program is part of BWW's "Sister In Motion" Program, which aims to decrease " high blood pressure, diabetes and obesity through education, lifestyle change, prevention and physical activity." ¡Después de 5 años de organizarse con la comunidad local, PODER presenta Hummingbird Farm! La ceremonia de inauguración dio a conocer el nuevo nombre y reunió a la comunidad para deleitarse y plantar semillas en la tierra que rodea la granja. El evento fue organizado por PODER y la Comisión de Servicios Públicos de San Francisco, y es un excelente ejemplo de lo que una organización puede lograr mediante la creación de poder con su comunidad para crear salud y equidad alimentaria. Vendors for Health is an initiative created by Cultiva La Salud that aims to bring healthier food choices to the Fresno community. Vendors For Health are mobile food vendors that sell locally sourced fresh fruit, veggies and prepared snacks daily. The Mobile Vendor business model seeks to empower locally owned small business and the community while selling healthy food! Interview with Genoveva Islas, Executive Director of Cultiva La Salud. Vendors for Health es una iniciativa creada por Cultiva La Salud que tiene como objetivo brindar opciones de alimentos más saludables a la comunidad de Fresno. Los vendedores para la salud son vendedores ambulantes de alimentos que venden fruta fresca de origen local, verduras y bocadillos preparados todos los días. El modelo de negocio de Mobile Vendor busca empoderar a las pequeñas empresas locales y a la comunidad mientras vende alimentos saludables. Entrevista con Genoveva Islas, Directora Ejecutiva de Cultiva La Salud. Music by: Kaido - "Junction 9"
Acta Non Verba: Youth Urban Farm Project (ANV) elevates life in the inner-city by challenging oppressive dynamics and environments through urban farming. Founded and led mainly by women of color from the surrounding neighborhood and larger community, ANV creates a safe and creative outdoor space for children, youth, and families in East Oakland, CA. Within this severely economically depressed neighborhood in the nation’s second most dangerous city, ANV engages and deepens their understanding of nutrition, food production, and healthy living as well as strengthens their ties to the community. This is a case study video in a series entitled Communities Building Power For Health, produced by The Praxis Project. Shot and edited by Anesti Vega. Roots & Remedies, organized by The Praxis Project and partners, is an annual gathering that took place in 2017 in Oakland, CA and brought together grassroots organizations from around the country working with working class, communities of color, youth, women, folks with disabilities and LGBTQ communities, among others.